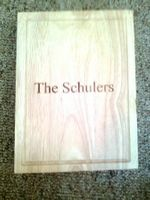 This rubber wood cutting board holds a secret - a pullout drawer that has 3 stainless steel cheese tools inside. The board measures 10.625" x 7.75" x 2" thick. The wood is from cultivated rubber trees, a renewable resource. The tools, ranging from 7" to 8.5" long, feature stainless steel handles, blades and forks. Want to make this gift really unique? Add a monogram, name or special message. White Gift Box. If you are looking for a longer inscription please call us and we can accommodate requests.